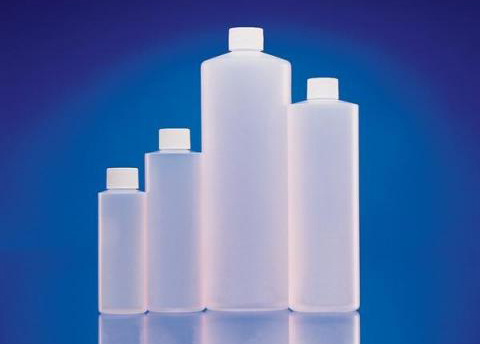 Our natural HDPE plastic cylinder bottles are versatile in function and can be used for a variety of applications. These translucent bottles are square shouldered with flat bases and come with white polypropylene F217 lined caps. The F217 liner consists of a three-ply co-extruded liner consisting of foamed and solid LDPE. The foam core of the liner is sandwiched between two pieces of solid LDPE. The exterior of the caps have ribs for better grip when twisting the cap on and off. This HDPE bottle and cap combination is chemical resistant and ideal for a wide range of material storage applications, making them a great choice for product storage of acids, alkalis, solvents, alcohols, oils, aqueous products and much more. To see our full selection of these containers please go to our Laboratory Supplies & Equipment section and find them under Bottles & Jars, Plastic.